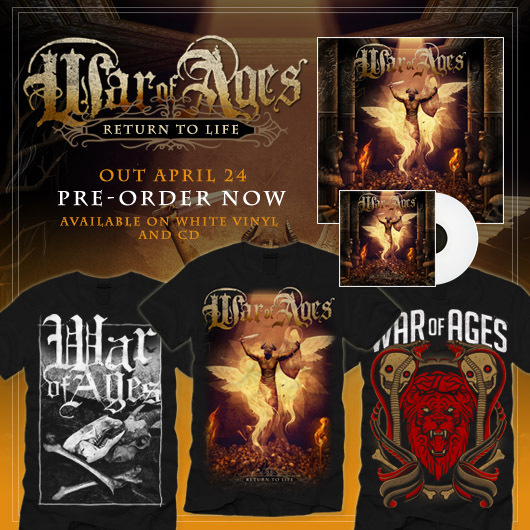 You can now pre-order the brand new War Of Ages album “Return To Life” in our online store! Multiple pre-order bundles are available for you to choose from, and we have a very limited amount of white vinyl for this release (only 500 made!). Each order also comes with a free 18″ x 24″ poster of the amazing album artwork (view a large version of the album artwork here ). You can now preview the first 5 songs from the album on our You Tube page . And make sure to check out the incredible contest prizes we are offering when you pre-order “Return To Life” in our online store . Read all about that in the post below. “Return To Life” will be released on April 24.